Do you remember Alice Jones? Alice Jones graduated in 1969 and was inducted into the Hall of Fame in 2013. Alice Jones was an active student. She was an annual representative, in The Sounds of Withrow, Thalian, Senior Choir, Dux Femina, Dolphin Club and GAA President. Alice was an outstanding swimmer and missed qualifiing for the 1968 Olympics by 0.1 sec. She swam for the Cincinnati Marlins; and in 1970, Alice held the US records and was the National Champion for the 100 and 200 meter butterfly. 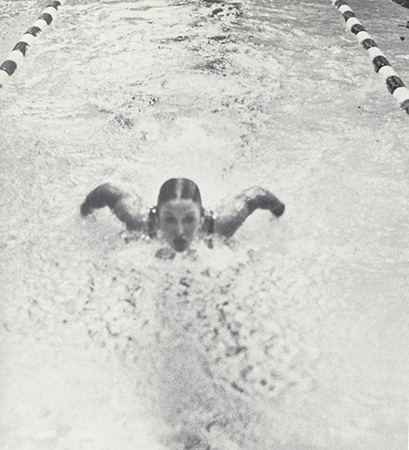 In 1970, Alice held the World Record in the 100 and 200 meter butterfly and the 400 meter Medley Relay. She was also World Female Swimmer of the Year. In 1971, Alice won a Silver Medal in the Pan-American Games. Illness prevented her from competing in the 1972 Olympics. Alice is currently a swimming instrutor in Florida.